The purple wrist band represents hope and the idea behind Relay For Life, the American Cancer Society's premier community event, that those lost to cancer will never be forgotten, that those who face cancer will be supported, and that one day, we'll all be cancer-free. 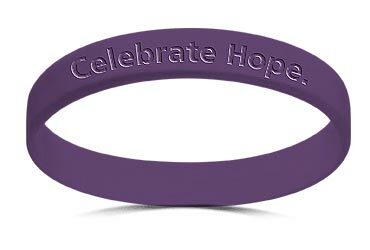 Help support Relay For Life, the American Cancer Society's premier community event, by ordering this wrist band today achieve our goal of a cancer-free world. Help Celebrate Hope. Give wrist bands to your friends, family, and co-workers and help spread the word about Relay For Life, the life-saving work of the American Cancer Society. Have you caught the Relay For Life purple fever? You have, well go ahead pass it on to your friends and family. Get your purple �Celebrate Hope� wrist band and �Pass Purple On� to others and get them to commit to take part in Relay For Life. The purple wrist band is a personal invitation from you to others to join the thousands of participants in the celebration of survivorship that is Relay For Life. For more information about Relay For Life visit www.cancer.org/relayonline. To get involved in Relay For Life, please visit www.cancer.org/RelayOnline, or call the American Cancer Society at 1.800.ACS.2345.